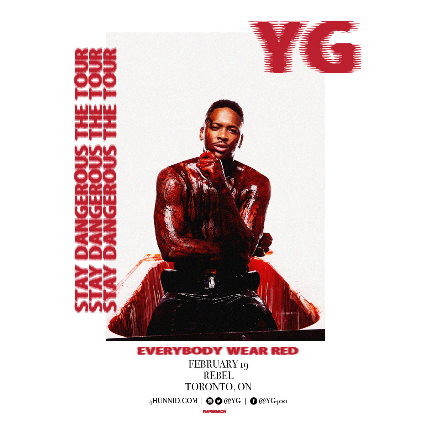 RAPSEASON is proud to present YG at Rebel at an all-ages show on Tuesday February 19, 2019. The Compton, California native, born Keenon Jackson, released his first two mixtapes in 2009 and 2010. The latter tape featured Toot It and Boot It a low-profile collaboration with Ty Dolla $ign that reached number 67 after it was licensed to Def Jam. YG continued to favour the mixtape format and made his Def Jam album debut in March 2014 with My Krazy Life. Supported with the multi-platinum DJ Mustard productions My N*gga (aka My Hitta featuring Jeezy and Rich Homie Quan) and Who Do You Love?" (featuring Drake), the album debuted at number two on its way to platinum status itself. A short film and accompanying soundtrack, Blame It on the Streets, was out by the end of the year. Anchored by another platinum single, Why You Always Hatin'? (with Drake and Kamaiyah), second proper album Still Brazy followed in June 2016 and debuted at number six. The rapper's third Def Jam set, Stay Dangerous, was preceded by another Mustard collaboration, Big Bank which also featured 2 Chainz, Big Sean, and Nicki Minaj. The track went Top 15 R&B/hip-hop ahead of the album's August 2018 release date.